Written by George Martin, Sea Of Time was part of the score for the Yellow Submarine animated film. The 41-piece George Martin Orchestra performed the soundtrack's instrumental pieces at Abbey Road on 22 and 23 October 1968. The players were conducted by the composer himself, with John Burgess and Ron Richards co-producing. 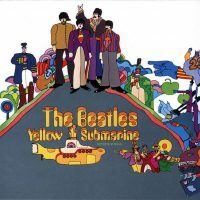 Sea Of Time was notable among Martin's Yellow Submarine compositions for its use of Indian instrumentation. It opens with a tambura drone, and a winding melody similar to that of George Harrison's Within You Without You. The Yellow Submarine soundtrack was released in January 1969, with Martin's pieces filling the second half. The US version treated Sea Of Holes and Sea Of Time as a single track. The UK LP, meanwhile, listed the two pieces separately, as did the 1987 international CD reissue. I certainly did. Strangely it became part of the whole Beatles deal for me. I was 13. I knew the Fab Four weren’t involved, but somehow it just made sense. Great instrumentation, and there were some lovely tunes in there, but you really had to listen to everything to find them. Mostly you could hear it was programmatic – describing something. But I couldn’t remember the details of the film until dvd came out decades later. Sounds just like ordinary film music too. I had a little Yellow Submarine book. A paperback of about 100 pages. I wonder what happen to that?! Maybe that helped with the overall Beatle feel. Remember, he was involved in Beatle orchestration, so kinda being the ‘fifth’ older Beatle gave it a strength any other MD wouldn’t have had. I am very glad to see Man-ley’s post. I salute you and your responses. But my experience is more in line with Samlata’s. I own the LP version of Yellow Submarine and I’m sure I’ve listened to Side 2 in its entirety multiple times. But it made zero impression on me. I would love to have there be some example of a great Beatles-independent opus from George Martin, and maybe there is–that Mahavishnu Orchestra album, or those America albums, or that Seatrain album–but this is not it. I think George Martin was a great producer/collaborator, but he was able to amplify the Beatles’ recordings in a specific way.